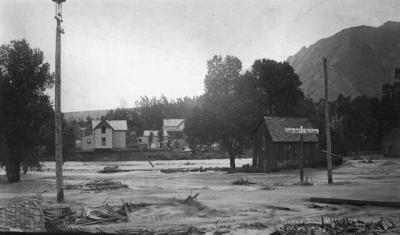 Photograph of flood along Boulder Creek in 1894 taken near 6th Street. Copyright by the Denver Public Library. Visit BASIN Gallery for more information. BASIN Natural Systems: What is a hydrograph? The Boulder area, particularly near the mouth of the foothill canyons, is prone to flash flooding. During severe storm events, rains falling on the foothills are funneled down steep mountain grades and then-- with tremendous force and often carrying tons of debris-- emerge from the mouth of the canyons to careen through urbanized areas. According to some experts including internationally reknown expert Dr. Gilbert White, the Boulder Creek drainage is considered among the most hazardous in the entire western United States due to the extensive development along the corridor and the potential for property destruction and loss of human life. While much has been done to map, mitigate and prepare for such an flood events, there are many businesses, schools and houses in the floodplains of Boulder Creek and its tributaries. In addition, floods are natorious for not following official flood maps, which are created primarily for flood insurance purposes. Major storm events causing severe flooding have occurred in recent years near the Boulder area -- through the Big Thompson Canyon on July 31, 1976, along Buffalo Creek, a tributary of the South Platte, July 12, 1996, and in Fort Collins on July 28, 1997. Sooner or later, perhaps not in our lifetimes, there will be a major flood event bigger than the 1894 flood along Boulder Creek or the 1939 flood along South Boulder Creek. What we can do now is to we aware and prepared for the inevitable. (See BASIN Gallery for historic photos of these floods). In future months we plan to offer the real-time flood warning information you will be able to access directly through BASIN that Emergency Managers use to prepare for and predict flash floods.